Do you sometimes hear voices in your head? If you do, then you might actually attribute it to the Force – where good advice comes from the Light Side, while advice that leads you down a shady path would be from the Dark Side. Of course, those who do not understand would ask you to see a shrink, or perform an exorcism on you. But no, as a staunch Star Wars fan, you know that you’re perfectly sane. What happens when you realize that all of those voices were actually an illusion, caused by the $9.99 Star Wars In Your Pocket that your friend keeps on pranking you with? 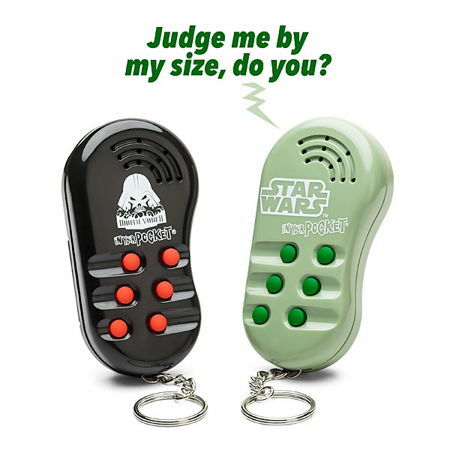 The Star Wars In Your Pocket is an interesting idea – it allows you to stash away a diminutive looking Vader or Yoda (who can’t get any smaller than his current stature, really) in your pocket or bag. Each keychain is capable of blurting out half a dozen, character-specific phrases that will send chills down your spine – that as much is guaranteed for the true blue Star Wars fan. Depending on which phrase you would like to listen to, press one of the six buttons and you’re good to go. Each of these unique keychains will be powered by a trio of AG13/LR44 batteries. I wonder if either one keychain can get the Voice Activated R2-D2 going.